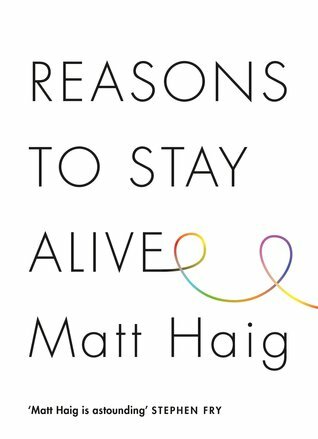 Reasons to stay alive is a very personal and honest account of Matt Haig's experience of depression and anxiety. The book tells the story of a deep and debilitating illness and the effects it has on the sufferer and his loved ones. The book takes the reader through the darkness of depression and anxiety as well as the light at the end of a sometimes very distant depressive tunnel. The book is written in small chapters, which makes it easy to read and references wise quotes from philosophers, artists and authors. The book breaks from the convention of your average memoir with the Matts lists of insightful and amusing thought patterns and then and now conversations which are very relatable. I really enjoyed this book but I think it's important to recognise that this book is a story of someone's journey and is not a self-help book. Anyone that reads my blog will know that I am painfully honest about the struggles that myself and my daughter face through her battle with mental health and I feel that Matt Haig's Reasons to stay alive delivers an honest and relatable account of the absolute misery that is depression and anxiety. I especially appreciate Matts account of anxiety and how controlling and life-changing anxiety can be. The chapter named 'The Art of Walking On Your Own' mirrors very accurately my own experiences for anxiety when I was in my 20s and behaviours I now see in my own daughter. Get a grip. Get a grip. But on what? There is nothing to grip onto. Everything is slippy. Unless you have experienced Anxiety, it is very difficult to understand the irrationality and control it has over your life and I think this book depicts anxiety in a way that makes it easier for those supporting sufferers to understand the thought processes of those suffocated by it. Firstly before I read this book I checked out the Amazon reviews and there were a few negative reviews regarding Matts lifestyle and how lucky and privileged he is with his trips abroad, support network and loving girlfriend (now wife) but for me this is the exact thing that makes this book so good and so relatable.It challenges the stigma of depression. Not everyone who suffers from depression does so as a result of PTSD or difficult or an abusive childhood or living in poverty and unemployment. People who from the outside can seem privileged or 'normal' can suffer from mental health problems too because it is an illness of the brain, a chemical imbalance not always because of social causes. My second point is that this book will not give you a happy ending. Because depression is lifelong. It will rear its ugly head from time to time. 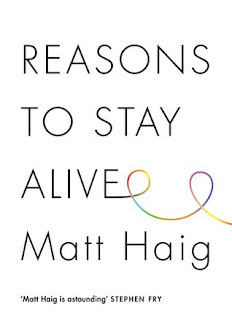 This book won't offer the reader reasons to stay alive and I think if Matt Haig had tried to do that it would have been patronising because reasons to live are personal to each human, but what he does do is highlight that there are reasons to stay alive and if you hang in there you will find the strength to look to the future. My one minor criticism of this book is that although Matt talks about things getting better and living again he doesn't provide much detail on whether he used talking therapies or CBT, he does make it clear that medication wasn't an option for him although doesn't deter his readers from exploring this option. He does highlight the importance of lifestyle choices such as running, meditation and reading. Perhaps he didn't seek professional help form therapists? its not clear. But what is clear from the conclusion of Reasons To Stay Alive is that although depression and anxiety are life-changing you can learn to understand and challenge those demons and take the control back. You can have a future. Because I loved this book so much I am giving away three copies, just follow the Rafflecopter link, Giveaway ends 15th January at 11.59. The closing date is 15th January 2018 at 23.59 (GMT). So K is back home. I brought her home with the help of my sister last Thursday from Manchester she coped very well with the travel home. We have settled back into home life but yet again CAMHs are making my ability to cope very difficult. I know my decision to discharge K and bring her back to Somerset was against their advice and has probably increased their workload but to be honest I care about that as much as they care about sending peoples children hundreds of miles away to an inferior medical facility. 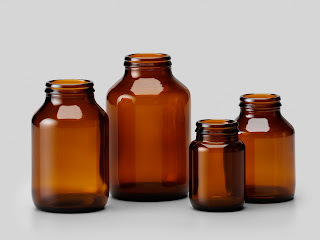 When I discharged K from Cynet Bury they would only give us enough medication to last 4 days. I spoke to her care coordinator on Wednesday with my intention to discharge her that day so they were well aware she would need a new prescription, rang and spoke to her Pysch's medical secretary on Thursday afternoon to confirm what she needed and she promised to arrange a prescription to be put in the post Friday morning. Its now Tuesday, and no prescription. K is now on the 2nd day without Fluoxetine and Risperidone. I've spent the morning on the phone and all I seem to meet is a shrugged shoulder attitude from the professionals. I've spoken to the CAMHs receptionist who relayed a conversation she had had with the medical secretary which pretty much stated that they posted it on Friday, they cant control the post and that as I couldn't personally collect it on Friday there wasn't anything further they can do. Spoke to NHS 111 who whilst were very friendly and helpful, cant arrange a prescription without speaking to the Psych it has to be down to a doctor, who yesterday told me they cant write a prescription without discharge notes and info from the psych either! Finally spoke to a manager at CAMHs who basically said he won't fax another prescription until tomorrow in case it turns up. He advised there won't be any negative withdrawal effects for at least 48 hours from the abrupt halt of the medication. i sincerley hope he is right about that. Why do they make it so hard for me to cope? If big boss man can fax a prescription tomorrow then why couldn't they have done that on Friday? Why not today? If I'm being irrational (which at the moment I mostly am) i feel this is CAMHs reaction to me discharging her from Hospital against their advice, a punishment. I guess they think why should they bend over backwards to sort out a prescription when she should be in Manchester. What they don't realise is the pressure and stress this puts me under as her carer. I can control most things, but I do not have the ability to access her medicines without their help. One of the things that have been highlighted to me by family and by Professionals in the last month has been how unassertive I am. How I don't feel able to make demands for what I need, I've always been a bit of a doormat- a product of my childhood unfortunately but I don't think this only applies to my children but to my relationship with Ks mental health team too. Since she has come home I have coped very well. In fact, the only time I have felt overwhelmed, anxious or out of control has in fact been with the stress of the missing prescription. and with my dealing with the CAMHs professionals. I have managed her moods very well. In my current struggling state of mind, i feel like I don't want to engage with these services anymore and that through their failing all they actually do is make my situation to cope with Ks mental health (and protect my own) harder. Wish i could sign off this post abit more positively! So K has been away from home for three weeks now. I've been up to Manchester to see her three times and now Christmas is looming. I'm still struggling financially and emotionally. I have managed to agree a 4-day return to home for Christmas with her doctor and am now faced with the monumentus financial and logistical challenge of getting her home for Christmas. As the trip takes 5 hours each way and can be quite stressful with train changes, using the tram and finding taxis I am at the moment considering the best way to do this whilst avoiding as much stress and anxiety to her. The very nature of her illness means that she really struggles with crowds. Her current mental state means that she is very aware of security cameras and people watching her so I am trying to find a way to transport her home as gently as possible. Anyone who has ever been to Manchester Picadilly train station will know that it is a huge station with hundreds of people making journeys. I think the best way to get her home would be to travel mid-morning so that we avoid the commuters and the station and the trains will be a bit quieter. The problem with this is that it is impossible to do this in one day so I need to stay in Manchester overnight and bring her home the next morning. I've done some calculations this morning and the whole journey- bringing her home on Friday the 22nd and then taking her back on the 27th will cost in all £360. This is the room overnight and train travel for the two of us and doesn't take into account any taxi's, food and drink or any other expenses. I'm still accumulating my train tickets for the journeys I've taken so far, the carer Assessment advisor has found a charity that has a grant I can apply for up to £500, and I've borrowed money from my sister to visit yesterday I'm yet to have enough tickets to submit my application for help and I have bills that have gone unpaid this month to enable me to visit her. So I'm in a position of if and when this grant is paid do I use this money to pay my outstanding bills or do I use this money to bring her home for Christmas? I haven't bought any Christmas gifts for the people that I love because there is no money. So in desperation, I have set up a Just Giving page. I really didn't want to do this because firstly, it's embarrassing having to ask complete strangers for help, secondly because I've always provided everything that my children need and thirdly because I want to protect Ks identity in the community where we live. But with two and a half weeks to Christmas, I'm getting desperate, I cannot do Christmas without my child, this isn't even an option. You can donate here on my Just Giving Page. Any support would be much appreciated.